�����The metals fell back last week just after Gold had ventured well above the $1,200 mark. This morning Gold is a touch higher from the opening, now at $1,195.50 and Silver is $17.13. 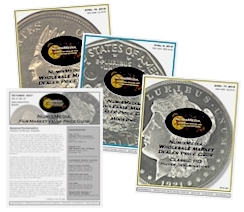 The one ounce Proof Gold Eagles are at $1,405 wholesale and the one ounce Proof Silver Eagles are virtually unchanged at $50 with the OGP. Silver Dollars are trading at $23,500 for a bag of 1,000 as long as they are VG and better. Keep in mind that Peace Dollars will trade at least a dollar less than Morgans. Silver bags of 90% are wholesaling at $13,450. �����The Walking Liberty Half Dollar has always been popular with collectors. However, since the beginning of 2012, prices for the most common dates have fallen considerably; the MS64 is down from $64 to $47 Market, the MS65 is down from $122 to $79, the MS66 is down from $185 to $125, and the MS67 is down from $665 to $440 Market. 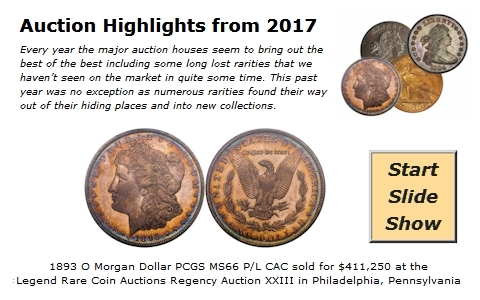 These are sizable drops, yet, at these lower prices, these dates have the potential to increase in value as they could bounce back in the coming years. Also, today�s market is allowing buyers to be more selective and purchase only the coins that appear to be upper end and have good eye appeal. 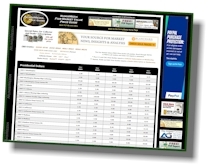 �����This week�s HD Wholesale Market Dealer Price Guide show a lot of activity in the marketplace, however, the declines outnumber the increases. In the Trade Dollar chart, the 1873 and 1876 S in MS65 have dropped to $9,150 Market even though the 1873 has a population of just 17 coins and the 1876 S has a pop of just 25 coins. The 1875 S has fallen to $7,650 in the same grade with a population of 66 coins. �����If there is strong demand for rarity, prices are moving higher. The auction sale of the 1884 Proof Trade Dollar in PR63 advanced the Market value to $300,000, and also increased the PR64 value, now at $420,000. This is an extremely rare coin not often seen in the market.